The very first thing that I used to treat my hypos were jellybeans. You know, the ones that came in little packets at the Chemist, and had the glucose syrup mixed into the recipe. Those packets weren’t particularly easy to walk around with, especially once opened. The jellybeans often got squashed at the bottom of my bag, or went hard fairly quickly once opened. During hypos, it was easy to lose count of how many I’d pulled out of the packet and popped into my mouth. It was difficult to translate a serving size into individual carb counts per jellybean. Having to ‘chew’ through six of them during a hypo often felt like a lot of work. Not to mention all of the little bits of jelly that got stick in-between my teeth afterwards! They weren’t particularly cheap, and I absolutely hated having to throw all of the black ones that were left at the bottom of the packet into the rubbish bin! On occasion I would pick up a 1kg bulk bag, but I always felt like I was being judged for the number of hypos I was having from the Pharmacist behind the counter. It wasn’t until I joined the Young Adult Diabetes Committee last year that I entered the world of glucose tabs, which are one of the perks of being involved (just quietly, they’re the only reason I come along to meetings…) I absolutely loved how portable they were to carry around, with the ability to carry 40 grams of fast acting glucose in one very tiny container. One tablet was four grams of carb. Easy enough to count during a hypo. No sticky bits left in my teeth afterwards! 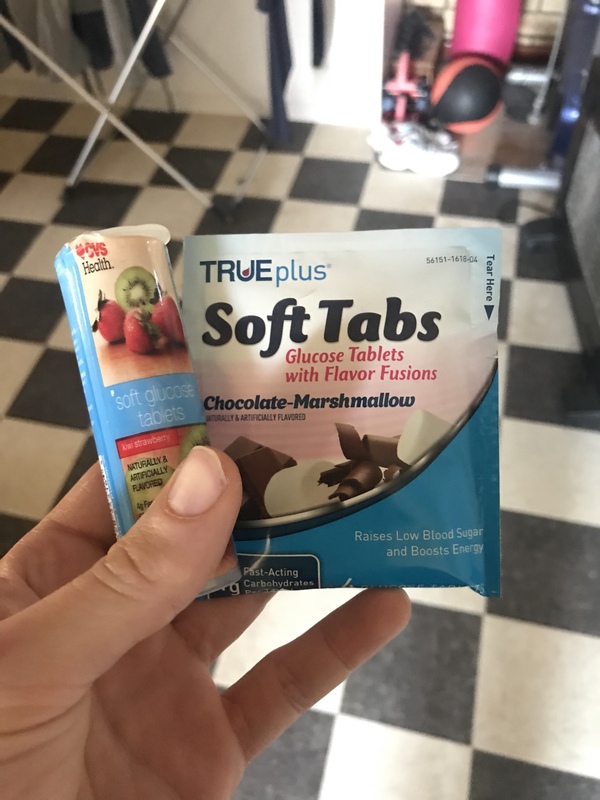 Anyhow, these TRUEplus soft glucose tablets were on show at the Diabetes Congress last month, where I picked up a few free samples. There are two new flavours, choc marshmallow and kiwi strawberry. I sure as hell envied all of the healthcare professionals in the exhibition hall who were able to taste them for fun! I consumed a few of the chocolate tabs during a hypo the other night, and I guess they tasted a bit like Cocoa powder or Nesquik. Meanwhile, the Kiwi Strawberry tabs kind of smell like our cupboard under the stove where the olive oil and salt is kept. They were also far less chalky than the Dex 4 tablets that I’m currently consuming. One tube of eight glucose tabs retails for $4.95. I was told that these will launch in December, available online, through some Pharmacies and at Diabetes WA. I’ve tried and tested a lot of hypo treatments over the years, and if there’s one recurring theme, its that I get sick of them pretty quickly. And I often have to will myself not to treat them with something more appealing like chocolate. So, hooray for more choices for people with diabetes! Disclosure: Diabetes Australia covered my registration, travel and accommodation costs to attend the Australasian Diabetes Congress. These are my own views, and not those of Diabetes Australia. My time, including the annual leave I took from work to attend the Congress, was my own. I love EloVate it is a glucose powder. But if not Elovate then chocolate fudge form CVS. Oh yeah Chocolate Fudge !!! How many will you have to consume to treat a hypo? 4gms? I probably need to eat at least 3-4 to get my hypo anywhere close to being treated, so $4.95 isn’t too cheap in my opinion. The sample packet I received states 5 grams per tablet. I agree they don’t come cheap. I know that there are also bottles of 50 in the true plus for refills, which might be a cheaper option?